Heart disease, cancer, and diabetes are among the leading chronic diseases and ultimate causes of death, not only among Americans as a society, but also in adults aged 65 and older, according to the Centers for Disease Control and Prevention. 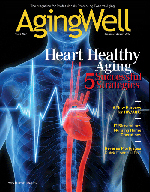 The good news is that research shows physical activity, smoking cessation, limiting alcohol consumption, and a healthful diet are more influential than genetic factors for helping elders avoid the deterioration associated with aging and decreasing the risk of chronic disease, slowing disease progression, and reducing disease symptoms. When working with older adults, “Prevention of chronic diseases isn’t as realistic as is control of symptoms and minimizing the need for medications and thus the negative side effects and drug interactions of these medications,” says Christine Gerbstadt, MD, MPH, RD, LDN, an Altoona, PA-based spokesperson for the American Dietetic Association. Interestingly, although research shows older Americans do recognize the importance of eating healthfully, they tend to turn for to medication and exercise treatment before making dietary changes. This may occur because the word diet evokes negative connotations among this age group, possibly necessitating giving up favorite foods and/or eating tasteless meals. Healthcare professionals can promote food as a primary therapy by putting a positive spin on the concept and using terminology such as eating plan, meal plan, or simply way of eating. Heart disease, including heart attack and heart failure, is the No. 1 cause of death among adults aged 65 and older. White men have the highest incidence of heart disease, while white women have the lowest. However, because women tend to have heart attacks at older ages than men, the attacks are more likely to be fatal. Heart disease is also associated with other chronic conditions, such as high blood pressure and diabetes. Genetic components also influence such conditions. Ideally, it’s best to consume a moderate amount of fat, which is defined by the American Heart Association as 30% of total calories. For example, if a person’s daily calorie intake is 1,800, 30% of this figure is 540 calories. Fat provides 9 calories per gram. Dividing 540 by 9 equals 60 grams of fat. This means an intake of 60 grams of fat for the day is ideal. Trans fat, a type of fat created in the commercial manufacture of baked goods and other items, has also been linked to heart disease through its ability to raise bad (low-density lipoprotein) cholesterol and lower good (high-density lipoprotein) cholesterol. Fried foods such as French fries and doughnuts frequently contain trans fats, as do baked goods such as pastries, piecrusts, biscuits, pizza dough, cookies, crackers, and stick margarines and shortenings. Mandatory labeling of the trans fat content in foods became effective January 1, 2006, making it easier for consumers to shop wisely. However, numerous companies have begun producing trans fat-free products. In addition to fat, salt is linked to heart disease through its role in elevating blood pressure and increasing the risk of stroke in susceptible individuals. About 64% of men and 74% of women aged 65 to 74 have high blood pressure, according to the American Heart Association. This increases to 69.5% for men and 83.8% for women aged 75 and older. Leading health organizations advise limiting daily sodium intake to 2,300 milligrams or less. The Nutrition Facts labels on foods list the sodium content per serving. Most salt in the American diet comes from processed foods and salt added during preparation. The Dietary Approaches to Stop Hypertension diet is effective for reducing blood pressure through an increase in the servings of fruits, vegetables, and whole grains in the diet. Increased longevity increases the risk of developing cancer. For example, men aged 60 to 69 have a one in six chance of developing cancer, increasing to one in three by the time they reach the age of 70, according to American Cancer Society Surveillance Research published in 2008. For women, the risk is one in 10 from the age of 60 to 69, increasing to one in four by the time they turn 70. Prostate cancer is the top cancer killer for men, while breast cancer ranks highest for women, with lung and colon or rectal cancers ranking second and third, respectively, for both sexes. “For people in their 60s, it’s still possible to reduce the risk of cancer with a diet that stresses fruits, vegetables, and whole grains,” says Gerbstadt. Approximately 42% of older men and 38% of older women don’t eat enough vegetables, while 29% of older men and 32% of older women don’t eat enough fruits. Also known as adult onset diabetes, type 2 diabetes is a chronic disease that compromises the immune system and increases the risk of infections. It can also increase the risk of stroke, heart disease, and other circulatory problems. In 2005, the prevalence of diagnosed diabetes among people aged 65 to 74 was about 12 times that of people under the age of 45 (18.5% vs. 1.4%). Diabetes treatment calls for controlling blood sugar, though there is controversy about the tightness of this control. For example, some studies have found that older patients with elevated fasting blood sugar levels had a 50% greater risk of mortality from cardiovascular and other chronic diseases. In addition, a 2005 study conducted in Germany showed that close-to-normal blood sugar control helped prevent symptoms of geriatric syndrome (e.g., intellectual decline, immobility, incontinence, instability). On the other hand, the chief concern about tight blood sugar control in older adults is the risk of hypoglycemia (low blood sugar). Hypoglycemia in elders is associated with an increased risk for stroke, heart attack, and seizures. Ideally, healthful eating, regular exercise, and loss of excess weight can control blood sugar, resorting to medication only if necessary. Many older adults “feel they have to take a vitamin supplement. It makes them feel better emotionally and psychologically. In this case, I recommend a generic one-a-day type that contains a variety of vitamins and minerals,” says Gerbstadt. There are pros and cons to nutrient supplements. For example, evidence points to health benefits such as increased bone mineral density and decreased fractures in postmenopausal women who take calcium and vitamin D supplements. However, other studies indicate an increased risk of lung cancer among smokers who take beta-carotene supplements. The National Institute of Health’s State-of-the-Science Conference Statement on Multivitamin/Mineral Supplements and Chronic Disease Prevention, issued in 2006, found no conclusive evidence of the need to routinely recommend supplements.